The talk show’s co-host Meghan McCain shot back, “I would never be comfortable supporting someone who called, ‘I’m not an anti-Semite, I’m an anti-termite,’ ‘It’s the wicked Jews, the false Jews that are promoting lesbianism, homosexuality,'” citing other statements attributed to Farrakhan. LIBERALS will make any excuse for their HATE. They only care about Power NOTHING more. If siding with a MORONIC HATE MONGER like Farrakhan gets them that Power they will use him just look at Jackson anc Sharpton. More proof, that these idiots have no moral core. by Samuel A. Nigro, MD, retired psychiatrist, copyright c 2018—(Found in my writings without references… Apologists for Islam are frauds if they do not know this; they are fools if they do). Muslim pirates of the past: Most Americans are unaware of the fact that over two hundred years ago, the United States had declared war on Islam, and Thomas Jefferson led the charge! At the height of the eighteenth century, Muslim pirates were the terror of the Mediterranean and a large area of the North Atlantic. They attacked every ship in sight, and held the crews for exorbitant ransoms. They attacked and savaged Italians by the thousands. Those taken hostage were subjected to barbaric treatment and wrote heart breaking letters home, begging their government and family members to pay whatever their Mohammedan captors demanded. These extortionists of the high seas represented the Islamic nations of Tripoli, Tunis, Morocco, and Algiers – collectively referred to as the Barbary Coast – and presented a dangerous and unprovoked threat to the new American Republic (Islam then; Islam now). Before the Revolutionary War, U.S. merchant ships had been under the protection of Great Britain. When the U.S. declared its independence and entered into war, the ships of the United States were protected by France. However, once the war was won, America had to protect its own fleets. Thus, the birth of the U.S. Navy. Jefferson was disgusted. Shortly after his being sworn in as the third President of the United States in 1801, the Pasha of Tripoli sent him a note demanding the immediate payment of $225,000 plus $25,000 a year for every year forthcoming. That changed everything. Jefferson let the Pasha know, in no uncertain terms, what he could do with his demand. The Pasha responded by cutting down the flagpole at the American consulate and declared war on the United States. Tunis, Morocco, and Algiers immediately followed suit. Jefferson, until now, had been against America raising a naval force for anything beyond coastal defense, but having watched his nation be cowed by Islamic thuggery for long enough, decided that is was finally time to meet force with force. He dispatched a squadron of frigates to the Mediterranean and taught the Muslim nations of the Barbary Coast a lesson he hoped they would never forget. Congress authorized Jefferson to empower U.S. ships to seize all vessels and goods of the Pasha of Tripoli and to “cause to be done all other acts of precaution or hostility as the state of war would justify”. When Algiers and Tunis, who were both accustomed to American cowardice and acquiescence, saw the newly independent United States had both the will and the might to strike back, they quickly abandoned their allegiance to Tripoli. The war with Tripoli lasted for four more years, and raged up again in 1815. The bravery of the U.S. Marine Corps in these wars led to the line “to the shores of Tripoli” in the Marine Hymn, and they would forever be known as “leathernecks” for the leather collars of their uniforms, designed to prevent their heads from being cut off by the Muslim scimitars when boarding enemy ships. Islam, and what its Barbary followers justified doing in the name of their prophet and their god, disturbed Jefferson quite deeply. America had a tradition of religious tolerance, the fact that Jefferson, himself, had co-authored the Virginia Statute for Religious Freedom, but fundamentalist Islam was like no other religion the world had ever seen (Same as today–Islam is a medical disorder as described in attachment). A religion based on supremacism, whose holy book not only condoned but mandated violence against unbelievers was unacceptable to him. His greatest fear was that someday this brand of Islam would return and pose an even greater threat to the United States. This should bother every American. That Muslims have brought about women-only classes and swimming times at taxpayer-funded universities and public pools; that Christians, Jews, and Hindus have been banned from serving on juries where Muslim defendants are being judged, Piggy banks and Porky Pig tissue dispensers have been banned from workplaces because they offend Islamist sensibilities.…and on and on including Sharia imposing communities which are totally un-American. Truth, oneness, good and beauty are not Islamic values nor are life, sacrifice, virtue, love, humanity, peace, freedom or natural death without fear. Wishful thinking and making nice with Muslims leads to being quickly conquered or slowly enslaved by Sharia. As Confederate statues and memorabilia have been destroyed because they were so un-American, so should all, since Jefferson, Islamic presence, appurtenances and reminders until Muslims return to Mohammed as in Mecca the First Time, when he was a pacifist, monogamist, hard working, traditional family supporting, against slavery, Catholic Mass attending, Hippocratic Humanbeing. I reject completely and forever that all nations who have not acknowledged the authority of the Quran are sinners; and that it is not my right and not my duty to make war upon non-Muslims wherever they are found or to make slaves of all I can take as Prisoners, and that every Musselman (Muslim) who should be slain in Battle was sure to go to Paradise (as other Muslims claimed when they declared war on the US around 1800). I pledge allegiance to this country and I reject its surrender to Islam; and I will fight to defend this country’s independence, culture, leadership and laws. If I break this promise, I will voluntarily leave, within six months, to go live in an Islamic country in the Middle East. I commit myself to Mohammed when in Mecca the First Time, when he was a Catholic convert from the paganism of his birth; was a pacificist, monagamist, against slavery, for humanbeingness, tolerant of all religions, and for peace/freedom; and not yet corrupted by powermad imams who put violent anti-love lies in his mouth and in the Quran. I reject all not consistent with Mohammed in Mecca the First Time as false Islam. The above Citizen Certification for Muslims” sounds wonderful, but it wouldn’t be worth the paper it’s written on, since it is not a sin for a muslim to lie to infidels. Which is why we SHOULD Not believe them, when they take the Oath of office.. AS WE KNOW for a fact, they are fully authorized to lie to the infidel, It should be seen as willful perjury. Urp, beyond me how any women could be so stupid as to associate themselves with any group led by this trio of disgusting scum sucking boors. 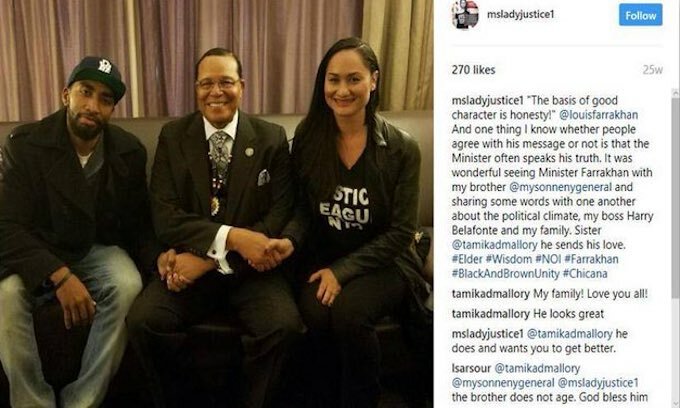 Tamika: makes it clear she has the hots for her smelly billy goat man, the loud & proud anti-Jew anti-white, Louis the screwy Farrakhan. She won’t be judged thru the lens of a man, just the lens of a jackass, oops, I mean a goat. Linda the Sour: radical Islamist advocate for Sharia & female genital mutilation. Mari Lyn, aka, Bob Bland: she co-opted name of a dead gay guy which makes one wonder if she should be leading the “fake” women’s march. She says she is against bigotry but obviously doesn’t even know the definition of a bigot which is someone intolerant of those who hold different opinions from oneself. Her speech & actions exemplify exactly what a “nasty” bigot is.